I’m feeling rather like Alice in Wonderland as I descend into the startling verdant gardens of Umpherston Sinkhole, which is otherwise known as the Sunken Garden. Lucky for me and unlike poor Alice, my pace is a leisurely stroll, and not a frantic tumble. However the feeling of reaching the bottom is just as surprising, as soon I am standing in another world: heavy drapes of vines cascading down the limestone walls, hedges of bright greenery and pretty garden beds filled with ferns and flowers adding to the fairy-tale vista. The original limestone cave that, millions of years ago, arched over the place where I now stand was formed by the dissolution of limestone. The sinkhole was created when the top of the chamber collapsed downwards. In 1868 James Umpherston purchased the land including the sinkhole, and in 1884, after retiring from farming, he decided to turn it into “a pleasant resort in the heat of the summer.” Back in the good old days there was a small lake in the sinkhole, and when people gathered to socialise, they’d also drift about on boats and enjoy picnics on the lake’s side. Mount Gambier, being built on limestone, has plenty of sinkholes to explore, including the famous Engelbrecht Caves in the middle of town. However my next journey into the Earth is at Kilsby Sinkhole, which despite having been around for thousands of years is a newcomer for tourists on the Mount Gambier cave scene. A sheep farming family have had this remarkable sinkhole on their property for four generations, and it has been used by professional divers for many years for training. Recently it has been developed so that tourists will now be able to enjoy snorkelling and, if qualified, scuba-diving in the stunning blue cave. The water is so clear that looking into it, the bottom seems as though it’s about five metres away, when in fact it’s around 30 metres below. A gin, aptly called Sinkhole Gin, will soon be released so that guests can enjoy a tipple on the new wooden deck above this natural phenomenon. 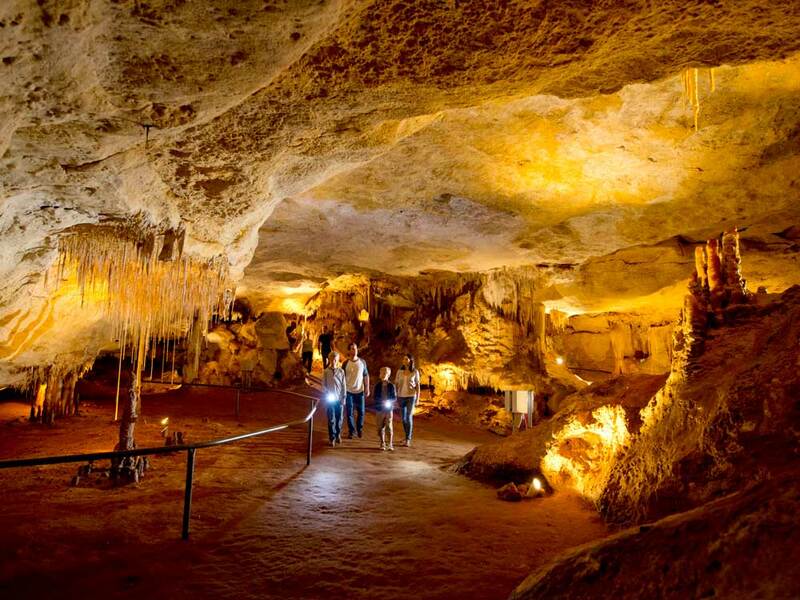 For anyone who enjoys caving, Naracoorte Caves should be on the must-do list. It is the only World Heritage Listed site in South Australia, and in the Victoria Fossil Cave you can see astounding piles of megafauna bones from creatures that fell through the forest floor around half a million years ago, possibly up to 800,000 years. Due to it being pitch-black and hard to navigate, they could not find their way out. Visitors can take an enthralling tour and see the bones of marsupial lions, giant kangaroos and five-metre snakes. Leave enough time to explore the many other caves in the region, as they also have extremely impressive exhibits and you’ll no doubt want to spend hours exploring. Driving through Mount Gambier and into the quaint 19th-century township of Penola, it’s a tough job keeping my mouth from hanging open. Due to the regular rain, sunshine, and lovely ocean breezes (which makes the grape vines extremely happy) the countryside is perennially lush. In spring, tens of thousands of roses of every imaginable hue are in full bloom. We cruise past the stunning Blue Lake that Mount Gambier is famous for, and visit Centenary Tower, which, due to it being 190 metres above sea level, offers incredible views of the city and the undulating volcanic landscape spread majestically below. Always seeking a portal into a place’s past, I visit the Old Mount Gambier Gaol, where husband-and-wife duo Melissa and James Stephenson have moved into the old warden’s house in order to tackle impressive renovations. The gaol was built in 1866 and many of its original features have been retained, but they’ve turned it into a charming boutique retreat and a very cool function venue. The past continues to permeate the present at the Royal Oak hotel and pub, where new owners have taken over and are dishing up superb meals created from fresh-as-it-comes local produce. It also has an awesome wine list. Hang out here with the locals and enjoy the lively atmosphere well into the night. 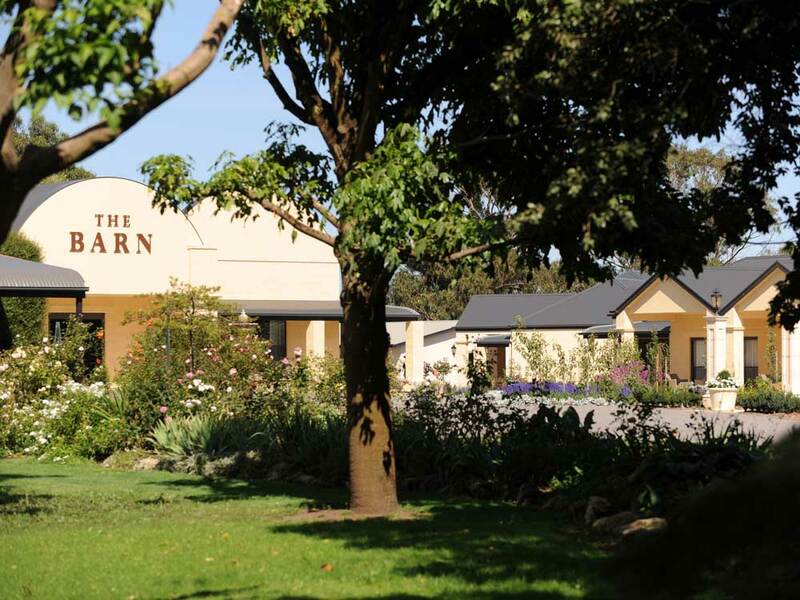 Back in Mount Gambier, another great place to wine and dine is The Barn Steakhouse, on the grounds of The Barn Accommodation. It has an award-winning wine cellar and stellar service to match. Set among five acres of manicured English-style gardens, the hotel is also famous for Generations In Jazz — an annual weekend jazz festival in early May. Penola is world-famous for the Mary MacKillop Penola Centre and Memorial School, and it’s worth spending at least a few hours exploring these and the beautiful street where many of the area’s first locals lived: Petticoat Lane. Circa 1885, the hamlet is famed for its original cottages and picket-fenced gardens, and visitors can step into rooms where families once lived. The lane’s name derives from the fact that, back in the day, a multitude of white petticoats blowing in the wind on garden clotheslines was a lovely common sight. For the next chapter of my Limestone Coast journey, Simon and Kerry Meares of Coonawarra Experiences take the lead. Their new business is a premier touring service that takes in all of the Limestone Coast, bringing together winemakers, producers and locals. Their combined knowledge, passion for the region and fun sense of hospitality add another colourful layer to the entire experience. Scot John Riddoch to join him. Riddoch arrived in 1861 and, luckily for us wine lovers, he took his friend’s advice and bought 1,147 acres of terra rossa to the north of Penola for his fruit colony – naming it after the Aboriginal word for ‘honeysuckle’: Coonawarra. Riddoch passed away in 1901, however his legacy lives on in the iconic winery – Wynns Coonawarra Estate – where 350 acres of vineyard (predominately Shiraz and Cabernet Sauvignon) have produced the 60 vintages that wine lovers collect as a prized set. Winemaker Sue Hodder carries on the legacy today, having made 25 of the 60 vintages, and the winery has recently opened an interpretive centre that takes visitors on an interactive journey through the region’s history, viticulture and winemaking. One of the many wonderful things about the Coonawarra is that most cellar doors are peppered along 24 kilometres of the Riddoch Highway, so over four days I fitted in four to five a day, meeting some of the most passionate, humble winemakers you’ll ever meet, most with awards tucked into their belts. Winemaker Sue Bell from Bellwether Wines, for instance, is a former Len Evans tutorial dux, and she produces some of the best Cabernet Sauvignon in the region, also experimenting with many European varietals such as Barbera, Tempranillo and Montepulciano. Her wines are quite high-end, but she has an Ant Series of wines (with very cool illustrations of ants adorning them) that are more accessible to the typical wine drinker. Since 1983, Hollick Estate has been creating handcrafted wines from their three local vineyards, and its restaurant, Upstairs at Hollick, was the first winery restaurant in the Coonawarra. Enjoy the “Feed Me” menu, where the chef creates a daily selection of plates to suit yourself or your entire table. Floor-to-ceiling glass doors opening onto a deck offer dreamy uninterrupted views over the Hollick “Neilson’s Block” vineyard. Balnaves of Coonawarra is attracting a lot of attention, as head winemaker Pete Bissell just won 2018 Winemaker of the Year, as awarded by The Australian Society of Viticulture and Oenology, and the company has released a $300 bottle of 2016 Shiraz Cabernet as a tribute to the 200th anniversary of the birth of William Wilson. Unusually, this was executed in collaboration with the renowned Redman family, with 55 per cent from Redman’s 80-year-old North End Shiraz, and 45 per cent from Balnaves 43-year-old Paulownia Cabernet Sauvignon vines. Having had the honour of tasting some, I understand why many locals are in a tailspin over it. Zema Estate has been producing excellent Cabernets and Shirazes for four decades. Cellar door manager Lyn Doyle says that its shiraz is flying out the door of late, and they’ve launched a special tasting where wines are paired with locally handcrafted white, milk and dark chocolate. What a sweet treat, especially if you choose to indulge before midday! Zema Estate is a part of the Coonawarra Wineries Walking Trail, which has locals and visitors embarking on a wine trail that also takes in Brands Laira, DiGiorgio, Drink Ottelia/Eat Fodder, Redman Wines and Wynns Coonawarra Estate. The first year was a resounding success and now an app has been launched to guide those wanting to wine, dine, walk and talk. Bowen Estate creates a fabulous mineral-rich hand-picked, hand-pruned Chardonnay, and with only 120 cases released a year, I can’t resist adding some to my growing collection. With a history dating back to 1867, beautiful Katnook is another gem, and its Katnook Odyssey and Katnook Estate Cabernet Sauvignon are amongst the 136 wines listed in the prestigious Langton’s Classification V11, announced in September 2018. Despite dedicating myself to wine tasting for three days, I do remember to stop and eat. Don’t miss Fodder, which is renowned for its fresh, light vegetable-laden dishes that are as inventive as they are delicious. The light-filled cafe-style restaurant is made for kicking back and relaxing in style, and here you can also taste the whole range of Ottelia wines. The Tasting Room at Mayura Station wagyu beef farm serves up wagyu dishes that are nothing short of spectacular. You can cut the steak with a butter knife. It’s no surprise that it was just awarded top steak restaurant in the country at the 2018 National Restaurants and Caterer’s Awards. Everyone seems to be a winner in these parts. Heading to the airport, weighed down by a suitcase of awesome wine and with many more bottles in the post, I must say that I’m feeling like one myself!